Background: A hunter was leaving the woods after an early morning hunt. It was a foggy, misty fall day in the Southern coastal plain. Personal Characteristics: He was an experienced hunter in his mid-30s and was wearing his safety orange hunting vest. A second hunter was driving down a nearby woods road. Due to physical handicaps, the second hunter was confined to his vehicle. Unsafe Act or Condition: The Hunter in the vehicle was not aware of the location of other hunters and did not take time to clearly identify his target. The hunter in the woods assumed the other hunter saw him clearly. Accident: The hunter driving down the road stopped his vehicle to look into the woods. The hunter walking towards the road proceeded toward the vehicle. The hunter in the truck noticed the movement and fired. Injury: The hunter in the woods suffered severe buckshot wounds to the face, arms, chest & legs. All club members should be required to know all stand locations prior to the day’s hunt. 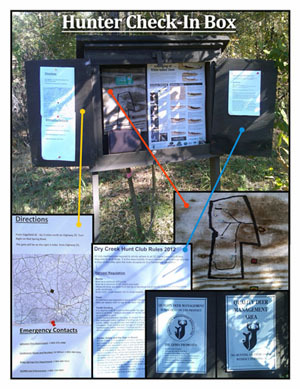 Check-in boards should be used on each hunting lease so that occupied stand locations are identified. No hunter should ever assume another hunter sees him. Quickly give a verbal signal when a vehicle or other hunter stops suddenly. Hunters should clearly identify a target before shooting and be absolutely sure, not only of the target but what is behind it. An overall site map of the property showing major features, and hazards, of the leased property and all adjacent property. Emergency numbers for the local fire department, local sheriff's office, emergency dispatchers/paramedics, and landowners. Directions to the site from major roads or towns to be used to direct the emergency response to the site. Land lease contract and safety rules of the club. Hunting members should be required to check in prior to commencing hunting activities and to check out after the day’s hunt. 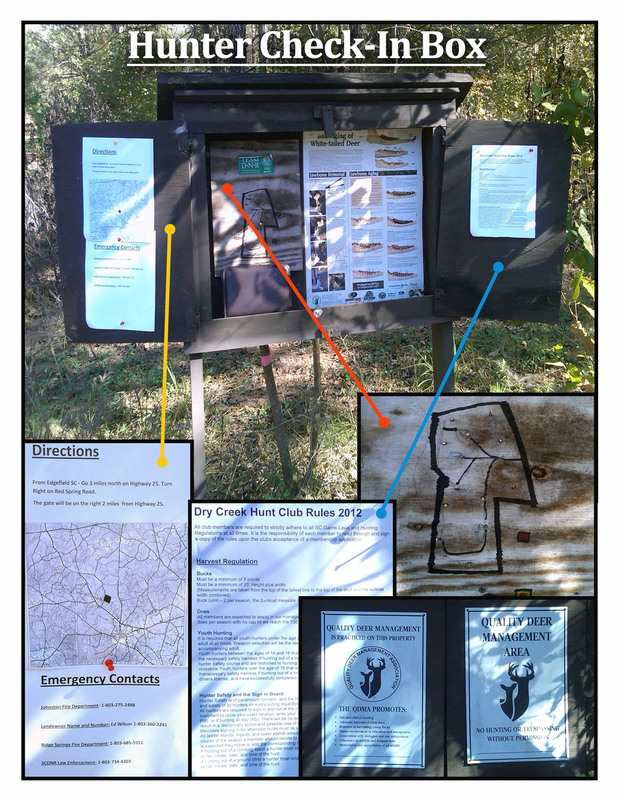 Hunt club guests should be required to review the map to familiarize themselves with property features, club rules, and emergency procedures.